New Zealand’s largest company, Fonterra, has announced its first ever net loss after tax of $196 million for the 2017-18 year, but ex-chief executive Theo Spierings has left with a final year’s salary of $8.08m. Last year Spierings was paid $8.32m, a 57 per cent jump from the previous year, made up of a $2.46m base salary, superannuation benefits of $170,036, and performance payments for 2016 and 2017 of $1.83m and $3.85m. That works out to about $159,000 a week, or $22,000 a day. In 2015, there was an outcry against his pay packet which led to Spierings requesting a pay freeze for the 2015-16 year, amid losses of more than 700 staff. New chief executive Miles Hurrell said Fonterra would immediately start with a strategic review of its investment in its Chinese partner Beingmate. Last year it posted a $745m after-tax profit, but in March it announced a $348m half year loss, following a write down of its Beingmate investment by $405m and payment to Danone of $183m following a court case over the 2013 botulism scare. Hurrell said the dairy giant’s business performance must improve. “There’s no two ways about it, these results don’t meet the standards we need to live up to. In FY18, we did not meet the promises we made to farmers and unitholders,” Hurrell said. Besides the Beingmate investment write down and the Danone payment, there were four main reasons for Fonterra’s poor earnings performance. The $196m loss was on turnover of $20.4 billion. The full year dividend remains at the 10c already paid in April. 1. Taking stock of the business – it will re-evaluate all investments, major assets and partnerships to decide if they support its strategy, are hitting their target return on capital and whether it can scale them up and grow more value over the next two-three years. 2. Getting the basics right – the level of financial discipline will be lifted throughout so debt can be reduced and return on capital improved. 3. Ensuring more accurate forecasting – the business will be run on more realistic forecasts with a clear line of sight on potential opportunities as well as the risks. Chairman John Monaghan said Fonterra was being clear on what it would take to achieve the forecast earnings guidance. “You can expect to see strict discipline around cost control and respect for farmers’ and unitholders’ invested capital. That’s our priority,” Monaghan said. Federated Farmers dairy chairman Chris Lewis said the big disappointment for him was the increase in debt. Fonterra’s gearing ratio has lifted to 48.4 per cent, up from 44.3 per cent. “Should heads roll? Let’s give the new CEO and chairman time to clean out the stables. It sure needs a new broom,” Lewis said. ASB analyst Nathan Penny said Fonterra was showing a worrying trend because, not taking account of the Beingmate and Danone issues, the underlying profit (EBIT) had fallen two years in a row for a combined $456m loss. Grant Davies, investment advisor at Hamilton Hindin Greene, described it as a “pretty disappointing result”. 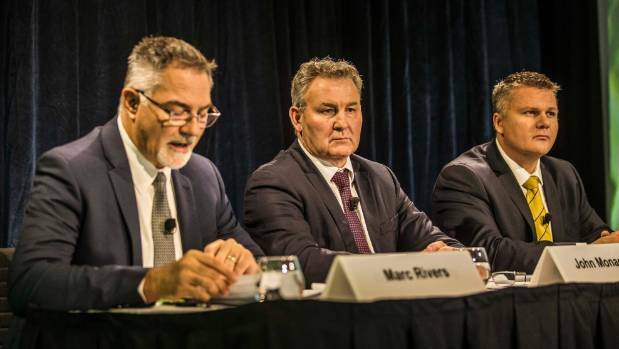 Davies said he was not a fan of Fonterra’s investment structure.